The Niagara and the Pride of Baltimore! 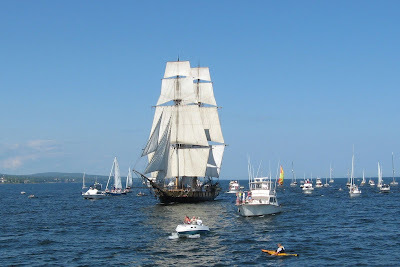 Both of these tall ships are right out of the days long past. 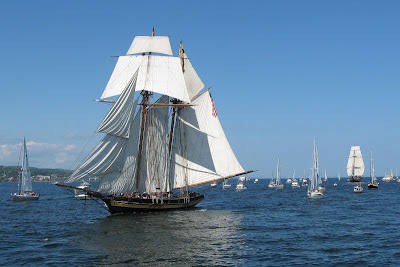 With real working cannons and just the right wind, these historical ships made history come back alive as they sailed within 30 feet of the expectant crowds in Duluth. The streps that are outside are actually not suffering too much in the days of 90+ degree heat. Perhaps that there has been enough of a breeze to keep the air flowing. The Sinningia 'Apricot Bouquet' might get big enough to see without a magnifying glass by the time it has to go back inside for the summer, and to my absolute horror..... I found out that chipmunks actually are very fond of digging up and EATING florist's Gloxinias. My double-flowering tuber is no more, along with about 4 others. Sigh.